There is all sorts of talk of food about this morning. Sunday Morning was all about food. The supermarkets are full of shoppers. Of course, the root of all of this food focus is the impending holiday. Thanksgiving is really a food festival, with a side of football. We are by ourselves once again. Not alone, we have each other. Since Ashlan left for college we have not had a child home for Thanksgiving. The US version that is. For four years we had Canadian Thanksgiving at our house. It was great fun, and we got to have lots of friends over. You see – none of them had T-day plans for October, so we were the best game in town. On the US Version we would either celebrate at home, at others, or sometimes with a nice long walk (with a turkey sandwich). This year we have been identified as orphans and invited to a friends house. So yesterday, we went shopping for a pumpkin (for soup). Really a soup tureen. While we were at the farmers market, we decided to by some salad fixings. A bag of “salad greens”. So – cut to dinner. Pork chops, cooked with apple and onions, and salad. I made dinner (for a change). Shook out some of the greens (actually all of them, but then I put 2/3 back in the bag). Washed and spun the greens. Tore many of the leafy bits into smaller pieces. Put the greens into bowls with tomato, green pepper and mushrooms. Dress and ready to go. Carl made it into the eating part before I sat down. Then, before he took a bite of his salad – a caterpillar crawled out. Not a small little green wee bit of protein, but a woolly black and orange version – about one inch long. He escorted said visitor outside. I am not sure how I missed him/her during the salad prep. I will admit I was not looking for a caterpillar, but I was rather hands on with the greens. This entry was posted on November 18, 2012 at 9:54 am and is filed under Uncategorized. You can follow any responses to this entry through the RSS 2.0 feed. You can skip to the end and leave a response. Pinging is currently not allowed. 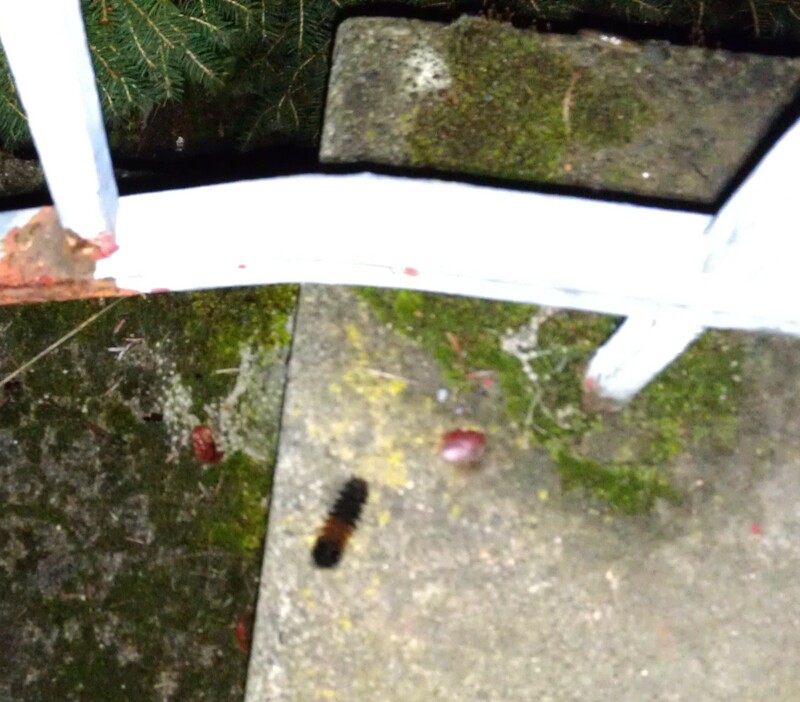 In Missouri, they call those “wooly bears”, and supposedly the width of the stripe determines how long winter will be. still, wouldn’t want to see one in my salad. a wooly bear! they are nice. and yes, looks like your winter won’t be too long. although who knows where exactly he originated….